Jeff Waddington and Camden Bucey speak about Francis Turretin and his insights into the much debated topic of right reason. Theologians have debated the effects of sin upon the mind. In the Reformed world, this debate often centers upon figures such as Charles Hodge and B.B. Warfield of Old Princeton in addition to Abraham Kuyper and Cornelius Van Til. Jeff Waddington brings Francis Turretin’s thoughts into view. 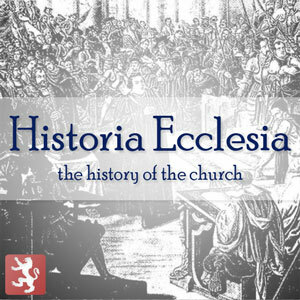 Historia Ecclesia is an audio program dedicated to the history of the church. In each episode a particular event or person that is influential in the development of the church will be studied in order to inform the present day. Browse more episodes from this program or subscribe to the podcast feed. Thanks for that guys. I haven’t read Turretin so Jeff’s remarks were very helpful. I liked the off the cuff nature of the show. More please. It took me several years but I finally made it through Turretin’s 3-volume set. I love this style of elenctic theology. A good project for some ambitious Westminster grad would be to follow the question and answer polemic example addressing modern issues. If you are looking for someone who is an expert in Turretin I recommend Dr. Carl Bogue, who is minister at large at our church. Calvin OPC (Phoenix) sends its greetings.